Last weekend was pretty crazy with all the Thanksgiving madness but then Michael left for a work conference Tuesday morning and didn't get back until last night so James and I have been quite sad and "daddy"-less. I did take the opportunity to be super productive and do some cleaning and bake cupcakes (and James' birthday smash cake!) for James' 1st birthday party which is next weekend *gasp* I also had my friend Amanda come over on Wednesday to keep us company and we made liege waffles (I used Baker Bettie's recipe)! We had a lot of fun and it's good that her and James got to play because his 1 year pictures are on Sunday and she's our photographer, so she'll be nice and fresh in his memory and hopefully he'll cooperate and be happy and cute for pictures. James has been a little weird all week, possibly because of recovering from last week's craziness, and possibly because Michael had been gone. Regardless, he's home now so hopefully things should be better. And wish us luck for tomorrow's photo session! This Is Us-That Tess moment tugged at allll the heart-strings and as for the ending-WHAT THE HECK DOES THIS MEAN??? ^^Just bought myself a bamboo toothbrush and I really love it! So excited to make another small change to help out the environment. 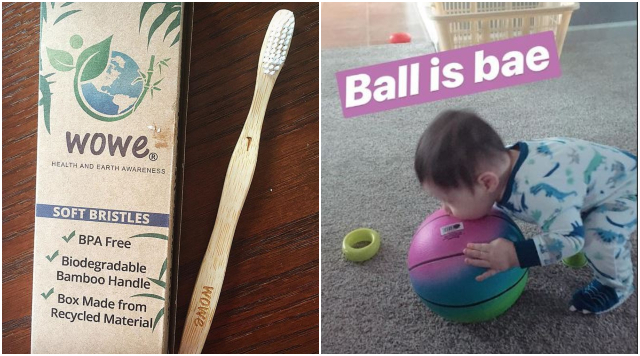 There are lots of bamboo toothbrush options but mine is from Wowe Lifestyle.